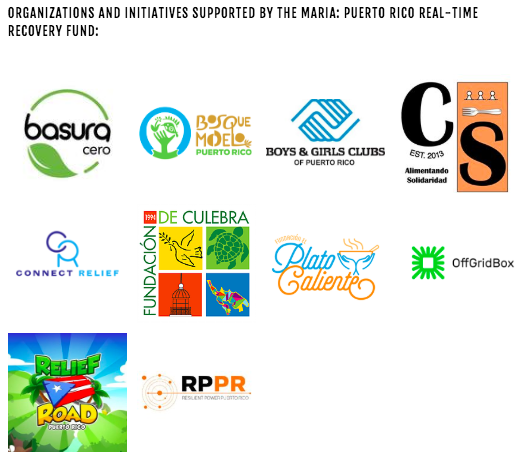 This initiative and fund, formally known as The María: Puerto Rico Real-Time Recovery Fund, has been organized in partnership with the Foundation for Puerto Rico, a 501(c)(3) corporation providing fiscal sponsorship of the fund. All donations to this fund are 100% tax deductible. You can keep track with our work via regular updates posted to our website and on Facebook. ¡Gracias! 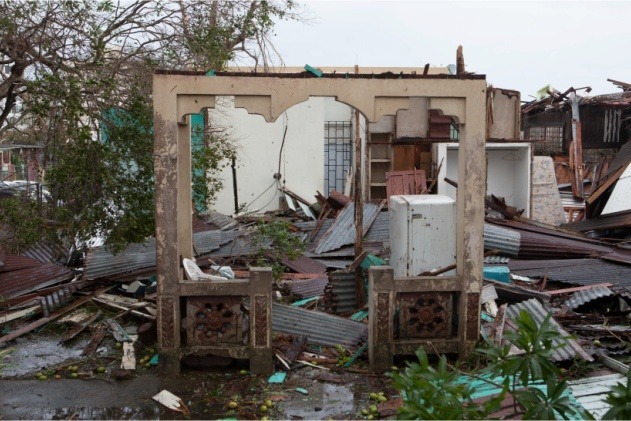 Since hurricanes Irma and Maria's devastating path through the Caribbean a year ago, there has been much to say about the destruction and loss of life which has scarred Puerto Rico and its fellow islands. Words cannot properly convey how impactful, sad and difficult it has been. Words also come up short when we try to express the resilience, generosity, and can do spirit that has permeated all walks of life across the island. Citizens of all stripes and capabilities have come together to take care of their neighbors, their communities, and their legacy and future. Pride in who we are and dedication to what we can achieve is the new normal. The road ahead is steep, fraught with challenges and hard choices, but the ultimate prize is worth the effort. ConPRmetidos ( http://conprmetidos.org/) recently led a delegation of over 30 Puerto Rican leaders to New Orleans to meet key actors and organizations behind the city’s remarkable recovery after hurricane Katrina. In partnership with the non-profit organization Friends of New Orleans ( http://www.friendsofneworleans.org/), and sponsored by the Skip Battle Foundation, island leaders from across various sectors -- from academia to tech, from foundations to healthcare, from community empowerment to venture capital -- were able to directly engage with counterparts in New Orleans who knew exactly what they were facing, what post-hurricane trauma feels like, and what it takes to move forward. 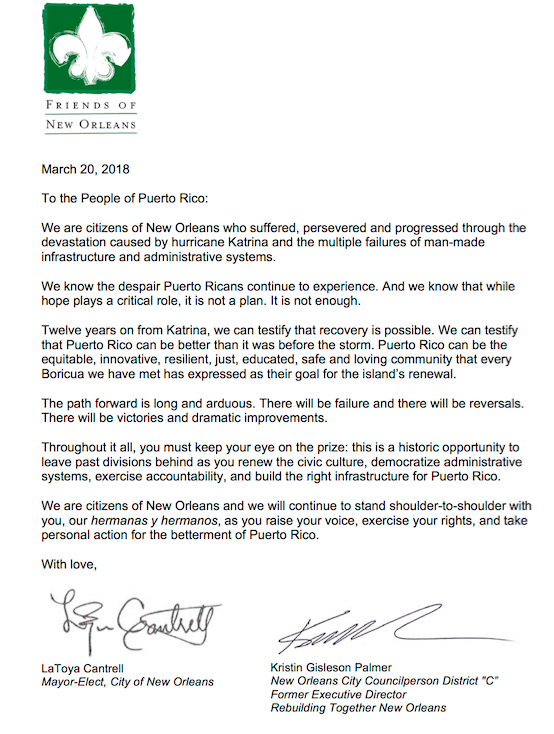 ConPRmetidos has synthesized the lessons learned by the island’s delegation in New Orleans into a publicly available document: Post-Maria Recovery: Lessons and Recommendations from Post-Katrina New Orleans. Taking cue from these lessons, a collective of local organizations that were part of the NOLA delegation -- including Parallel 18 ( http://parallel18.com/about.html), Colmena 66 ( http://www.colmena66.com/) and Centro Para Emprendedores ( http://www.centroparaemprendedores.org/) -- have committed to producing Puerto Rico’s first entrepreneurship week in November, a budding example of local entrepreneurship as economic driver. Similarly, Foundation for Puerto Rico ( http://www.foundationforpuertorico.org/) and ConPRmetidos jointly hosted the Six Months After Maria Forum on March 20, featuring a panel discussion that dived into the post-Katrina lesson of the importance of unified advocacy efforts and a unified political agenda. 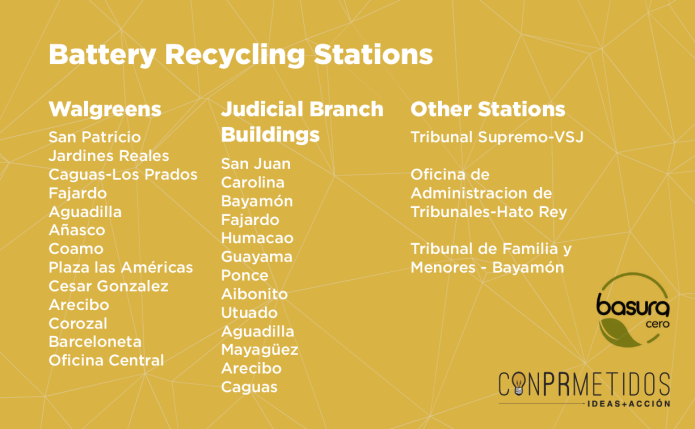 #Long-TermRebuilding As part of our commitment to Puerto Rico's sustainable development and renewal, ConPRmetidos is sponsoring a three-month long, targeted, battery-recycling program spearheaded by Basura Cero Puerto Rico in collaboration with the U.S. Environmental Protection Agency, the Department of Justice of Puerto Rico, and Walgreens of Puerto Rico. 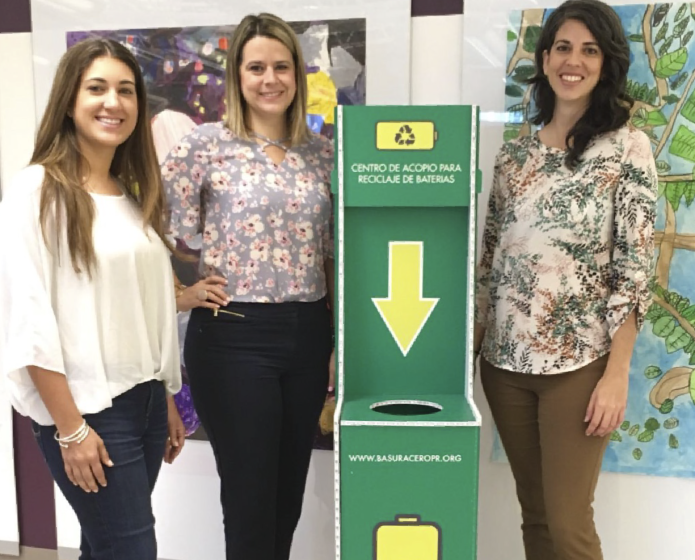 The latter two have been critical in activating their employee and customer bases to know of the program, and have each offered space in locations across the island for the placement of battery recycling kiosks. We strongly believe in the primary environmental protection goal of the program, and equally see it as an important model of how collaborative self-sufficiency across different sectors can work for a better future for Puerto Rico. In parts of the island, the need for immediate relief is still present and palpable. However, as other parts of the island progress, it is imperative that projects that contemplate the island's long-term recovery also progress. This includes, without a doubt, that we take an active role in the conservation of Puerto Rico's natural resources and human capital. If you are in Puerto Rico, please consider taking your used alkaline batteries (AAA, AA, C, D and 9 volt) to the nearest recycling station and encourage others to do the same by posting a Facebook "Check-In", sharing the station's location, and using the hashtags #Pontelaspilas #ConPRmetidos. In 2018, you can be sure ConPRmetidos will continue to identify and support initiatives which prioritize the long-term well-being and capability of Puerto Rico and its citizens. #EmpoweringDoers ConPRmetidos is committed to providing tools and platforms to those who have the ability to positively impact their community. 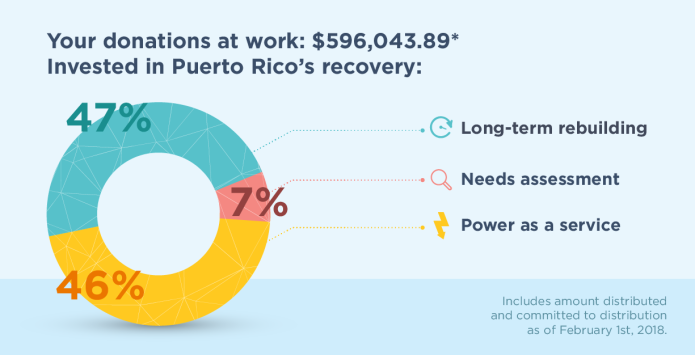 We recently provided an off-grid power generator to an outstanding community organization in Caguas, a small city in the mountainous interior near San Juan, which was seriously affected by the passing of Maria's eye. The Centro de Apoyo Mutuo ( http://www.facebook.com/Centro-de-Apoyo-Mutuo-2033558466880656/), established soon after the hurricane hit, is an initiative of Comedores Sociales de Puerto Rico ( http://www.facebook.com/comedores.sociales/). The Centro serves nutritious meals to well over a hundred people each Monday, Wednesday and Friday. And on Tuesdays, they offer acupuncture clinics to help reduce the toll of stress and physical exhaustion affecting so many across the island.